We use the latest and greatest ultra high frequency (UHF) RFID technology for chip timing! Runners wear UHF shoe tags and/or disposable UHF bib tags. We use a series of ground mat antennas, overhead panel antennas, and side panel antennas to start and stop their time. The amount of antennas we use depends on the size of the race. We also employ options for chip-timed check points, manual timing, photography and video as The video and photography footage can also be shared to the race director. Awesome job by Jimmy and his team. We held a 5k series in Seattle and Jimmy was always on time (like arrived at 6am as discussed), and results were always accurate. Text messages alerts went out to finishers and results were published in real time which was really cool for such a small race. Thanks Jimmy! John M. used this timer 3 time(s) 0/0 found this review helpful. View all Rivalry Events LLC reviews. 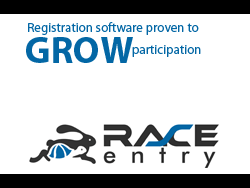 RaceEntry.com also cannot attest to the validity of individual Rivalry Events LLC reviews. All of the information about the Rivalry Events LLC has either been supplied by the event staff or can be modified at any time by their management.